In Lebanon there is a heritage so rich in history and an influence that pervades through the ancient Mediterranean basin that makes specifics difficult to ascertain. The mysterious nature of this time makes myth and legend the ancient’s form ancient history. The mythological assimilation of ancient God’s and Goddess’s creates a weave compounded by time, mystery and interpretation. In this way a beginning can be found in a seed or a stone and the worship of the mythological Astarte, the queen of heaven and her son, Baal. Astarte was the consort to El, the Canaanite Yahweh, and her fate in Israel was to be brushed out of history by the Jewish priests of the time and later, more fully, by the adoption of Christianity by the Roman Empire. This was done in order to preserve the monotheistic integrity of Yahweh and remove this as a cultural incursion from Phoenicia and known by the fate of Queen Jezebel. Jezebel was thrown from the walls of Jerusalem to be eaten by dogs at the behest of the King Jehu, She was the daughter of the King Ethbaal of Tyre and the great aunt of Dido. Astarte, in Canaan and the ancient world thrived as the principal Goddess. Also known as Asherah, Astarte was worshipped with the use of Asherah poles, which purportedly adorned the temple of Solomon before they were cut down, and burnt for being idolatrous. Astarte was a Goddess of beauty, love, fertility and war, the Greeks knew her as Aphrodite and Athena, the Akkadians as Ishtar and the Romans as Juno. Her name would travel from Canaan to the temples of Carthage and it’s founding queen, Dido. In the mountains of north Lebanon there is an ancient Olive grove, purported to be in the region of 7000 years old, as the realm of fertility and growth was the domain of the Goddess’s. The Olive grove would have been sacred to Astarte. As Athena was the chosen Goddess of the Greeks for the gift of the Olive tree, so Astarte would have been to the Phoenicians. The worship of Astarte and the God Melqart (to some a version of Baal) were spread as the unchanged principal deities of the Phoenicians from Lebanon to the Iberian Peninsula in Spain. A legacy of worship, for the Phoenician civilization that spanned approximately three millennia; from the depths of known history to the principle Gods of Dido, Queen of Carthage and Hannibal, Carthage’s greatest general. The story can begin with the kingdom city of Tyre and it’s greatest father, Melqart. Tyre was founded, according to Herodotus (as told by Tyrian’s in the mid 5th Century) in 2750 B.C, approximately 5000 years ago. Canaanite Tyre was a thriving city kingdom and trading widely with the Egyptians and also the kingdom of Israel. King Solomon’s temple was reputedly constructed with the help of Tyrian craftsman and the Lebanese Cedar was a precious commodity when trading with the wealthy but timber poor Egyptians. Melqart was the Lord or Baal of Tyre. This denoted him as the chief deity of the ancient island city kingdom of Tyre in south Lebanon. Tyre was founded mythologicaly by Melqart, but due to the dynastic nature of divine kings, also supposedly by a second son of an Egyptian royal family whose name was Agenor. Agenor’s family tree boasts Gods and kings of Egypt, Phoenicia, the Punic Colonies, Cilicia, Sparta and Thebes to name a few. Being the principle deity of the Tyrian trading nation, the worship of Melqart spread across the Mediterranean basin and fused with many more Gods ancient and new, and in particular, the Gods related to resurrection. The Gods of rebirth name amongst them, Dionysius, Osiris and Adonis, these Gods were typically celebrated in spring or Easter, when the land seems to resurrect itself from winter, plants begin to grow and the world ‘springs’ back to life. It is known that in Carthage and Phoenicia, the priests dedicated to the God of rebirth, had grand titles such as ‘Awakener of the God’ and sometimes ‘Of the Dead God’, their name presumably preceding the title. Whilst it is almost impossible to find the source of the ‘original’ Melqart, the intercultural cross-pollination of ideas and worship is a well-trodden path. And arguably a process of assimilation and fusion exists from the beginning of established lore. In this way we start with Melqart and find his name in Canaan as a Phoenician translation of the Sumerian Nergal and also as the more popularized identification of Heracles as known by the ancient Greeks. Melqart was a divine wanderer, never settling in one place for long, but moving on and expanding his legacy of deeds. He paves the way for civilization in inhospitable places such as Libya. By clearing the land of monsters, he evolves into a mythical cultural icon as he moves from east to west in legend and through the spread of Phoenician colonies. He is argued as to have been adopted by the early Phoenician colonies in the western Mediterranean on account of his legendary and divine status, his name bringing a sense of legitimacy to youthful cultures looking for a security through an esteemed and established cultural figure. But it can also been seen as the natural progression of worship of the God’s that these colonist brought with them from their homeland of Phoenicia. As the Greeks knew Melqart as Heracles and the Romans as Hercules, his legacy expanded and thrived to denote the legitimacy of cities, conquests and the divine right of kings and emperors. Melqart was Alexander the Great’s principle deity, and in this way association; whilst also easing cultural differences in the process of Hellenic assimilation and expansion enhanced Alexander’s image. Alexander, when arriving at Tyre in 332 B.C, appealed to the commonality of worship to the Tyrian’s to let him enter the city; when they refused, he built a land bridge to conquer it. The earliest reference to the topography of Tyre in history, relates to the myth surrounding the founding of the city. A combination of powerful symbolism that echoes through the ages were given as a sign to Melqart to construct a city and to shape two Islands to form the ancient city of Tyre. The myth pertains to the joining of the two Islands of Tyre to form one island. 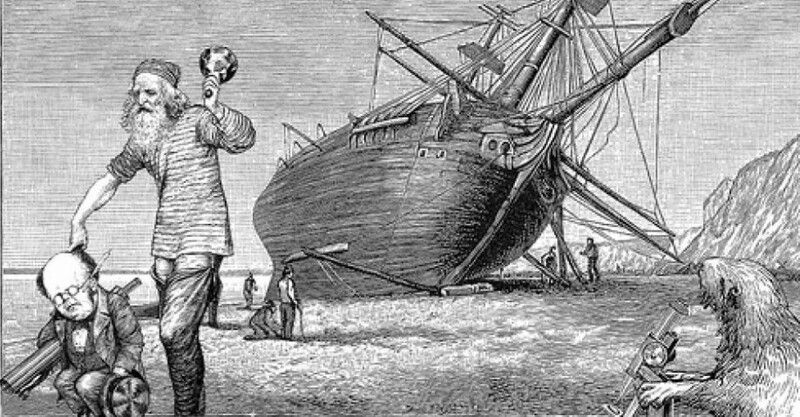 Melqart told the people of Tyre to build a ship and fasten the two islands together to stop the islands wandering off. According to the legend two wandering rocks floated over the sea; on one of them was a burning olive tree with an eagle perched on top of it, together with a bowl. A snake was entwined around the tree; both eagle and snake lived in harmony.The tree, the snake and the eagle represent powerful imagery and denoted serious importance in the ancient world. Today the Caduceus symbol of serpents weaving around a winged staff represent the medical profession in the United States. Carl Jung describes man seeing the symbol as his “full power of transcendence, whereby the lower transcendence from underworld snake consciousness, passing through the medium of earthly reality, finally attains transcendence to superhuman or transpersonal reality in its winged flight.” In this is the case then it seems like an almost animist process of attaining a higher state of consiousness is being manifested in a symbol, presumedly inspiring a sense of great worth. The association of these symbols then apparently the inspiration for the the mythological foundations of Tyre. This myth was greatly popularised by the Romans and found widely depicted on coins.Although I’m sure the location devoid of symbolism may have had some influence in its settlement. In Malta there is an inscription on a stone to Melqart/Heracles there in both Greek and Phoenician that testifies to them being one and the same. The Trials of Heracles, (The Greek conflation of Melqart), all tell of his epic journey in the pursuit of penance. Driven mad by the jealous Goddess Hera, Heracles kills his family. His road to redemption is in the form of twelve tasks all of which involve the subduing and slaying of beasts. He also manipulates the landscape by diverting a river to clean the Augean stables, all deeds telling of a taming of the wilderness, and propagation of the legend of a world changing demi God and one of the most mortal or human like Gods of the ancient world. Tyre’s greatest Colony was Carthage, and here Dido was her first Queen. Dido was purportedly the joint heir to the Kingdom of Tyre, her brother was Pygmalion, King of Tyre who reigned, according to Josephus, between 831-785 B.C. Carthage was reputedly founded in 815 B.C and it’s temples as in Tyre were dedicated to Melqart and Astarte. The Tyrian’s chose Pygmalion, even though just a boy at the time over Dido (or Alyssa as she was also known). After the murder of her husband and uncle, Acerbas, Dido escaped with her late husbands wealth and ventured to North Africa. Dido was deified by the Carthaginians after her suicide, an act believed to be committed in order to remain faithful to her late husband and avoid marriage to the Berber King Iarbas. Dido became the tutelary Goddess of Carthage and in this way we may find the same pattern as seen in the foundations on of Tyre. It’s founding father becoming its’ legendary God, Melqart. The word Carthage was the Roman rendition of the Phoenician name Karthadasht, which means “New Town” or new Tyre. The Worship of Tanit, the Carthaginian Astarte, represented the deification of the most essential matters that facilitate life. 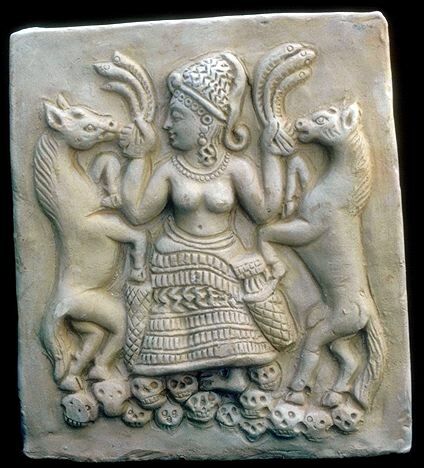 The Moon Goddesses, Astarte, Nikkal, Asherah and Tanit, relate to the menstrual cycle in women but also the precipitation of dew, so necessary to agriculture. The Sky, moon, moisture and fertilization all relate to the sacred female elements worshipped in Goddesses. As Greek civilization gave way to the Roman, and Heracles in name gave way to Hercules, Phoenicia’s greatest Colony Carthage still retained Melqart as the name for the Canaanite deity. The worship of Melqart would lend itself to the legitimacy of a pursuit or a nation, and with this powerful ally, who is the manifestation of great strength, fortitude and adventure, is found as the patron God of Hannibal. And Hannibal, one of Phoenicia’s and Carthages’s greatest prodigies, is found praying at the temple of Gades (Cadiz) to Melqart for victory against the Roman Republic in approximately 218 B.C. The name Hannibal breaks down to mean, ‘Baal be Gracious to me’, other Phoenician heroes have the same connections with names such as Himilco, Milkot or ‘Melqart is my brother’. These associations to Melqart promise great feats and strength along with the application of divine reverence. Hannibal lived in a world shaped by the legacy of Melqart; the Pillars of Hercules or the straits of Gibraltar were his gate way to the Iberian peninsular where the Phoenician colony of Gades or Cadiz was established. At the Temple to Melqart there, the great General reputedly prayed for victory before moving through the Pyrenees and all the way to the boot of Italy. ← Masonic groups out of date in Northern Ireland?